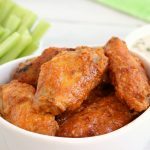 Delicious hot wings made in the air fryer in under 20 minutes. Use the sauce recipe provided or pair with your own favorite sauce! Combine all breading ingredients in a medium mixing bowl with a whisk. Coat both sides of each chicken wing with breading. Place wings in greased air fryer basket. Air fry at 400º Fahrenheit for 18 minutes. Melt butter, then whisk in garlic powder and hot sauce. When wings are done, place them in a mixing bowl and pour sauce over top of them.